In the spirit of a masqued revel, here is a gala presentation of tales set in Marion Zimmer Bradley’s beloved world of the Bloody Sun. 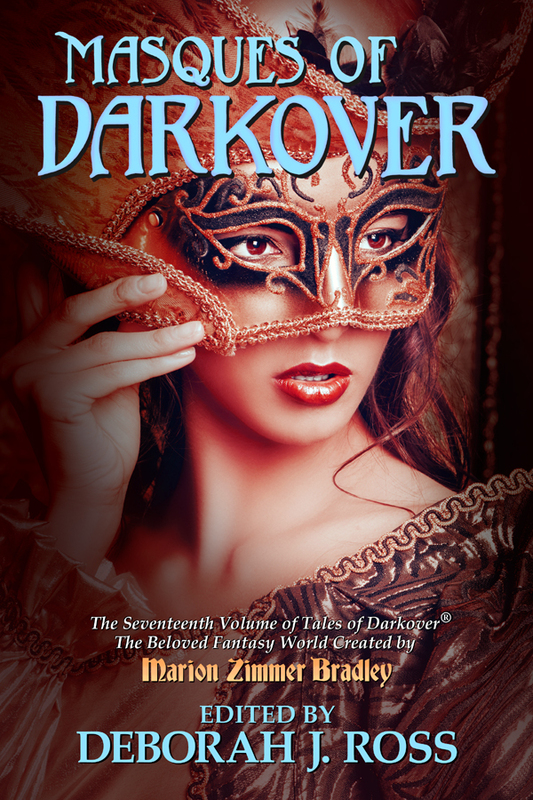 Some of these stories are humorous, others dark, some gritty, and others whimsical or romantic, but all reflect the richness and breadth of adventures to be found on Darkover. Here I chat with the marvelous authors who have enriched the world of Darkover with their creative vision. Masques of Darkover was released May 2, 2017 and is now available for at Amazon.com, Barnes and Noble and Kobo. Rebecca (“Becky”) started writing stories when she was seven years old and hasn’t stopped since. She lives in Lexington, Kentucky with three parrots, a chestnut mare, and a Jack Russell terrier who is not-so-secretly an evil canine genius, but no flamingos, pink or otherwise. In her other life, she’s a professional biologist with an interest in bird behavior. Deborah J. Ross: What was your introduction to Darkover? aimed at aspiring astronomers. I was roommates with a girl with whom I’d become pretty much instant friends, and one of the things she’d brought with her was an entire pile of books (see above: nerdy teenagers). She was kind enough to loan me two of them, since I’d been a little short-sighted in the reading material department, and hadn’t brought along any of my own. One of the books was Magic’s Pawn by Mercedes Lackey; the other was Hawkmistress! I devoured both within a couple of days, since I apparently didn’t believe in sleeping at that time in my life. The loan of those two books must have been some sort of omen, because while I didn’t in fact become an astronomer (having been seduced by biology instead), I have since written stories for both Valdemar and Darkover anthologies. DJR: What about the world drew you in? RF: Honestly, I’ve always been a sucker for animal stories and for plucky teenage heroines with a penchant for giving the finger to the established social order. Hawkmistress! was essentially the perfect gateway drug. As a teenager in the early ‘90s, I came for Romilly and her hawks and stayed for the magic (well, matrix sciences; same difference) and adventure. These days, as a professional academic with a taste for Le Carre, I’m in it for the politics, the culture clash between Terra and Darkover, and the tales of peripatetic scholars. Funny how tastes change over the years. Books in the vein of The Bloody Sun, which bored me to tears as a teenager, are now some of my favorites. DJR: What do you see as the future of Darkover? How has its readership changed over the decades? What book would you recommend for someone new to Darkover? RF: I think there are still lots of stories to be told about Darkover, since it’s not as though we’ve really dispensed with any of the issues Marion dealt with so eloquently in her novels. We’ve admittedly made progress in some areas, like women’s rights, but these days we humans here on Earth have the ability to make some pretty terrifying changes in the natural world, via techniques like gene drive, that put me rather in mind of some of the weapons from the Ages of Chaos. As far as readership goes, of course new readers are going to keep finding the series just as my friends and I did as teenagers twenty-odd years ago. I teach at the college level, and I can tell you that despite all the dire talk about smartphones ruining the world, my students still love to read and have an appreciation for actual books. If anything, they’re more sf-mad than my generation was in the ‘90s, thanks to Harry Potter and The Hunger Games and all the Marvel movies. DJR” What inspired your story in Masques of Darkover? RF: I still vividly remember picking up Leroni of Darkover from the bookstore down the street and discovering, at the age of fifteen or sixteen, that it was possible for other people to write Darkover stories. And I also vividly remember – as the sort of teenage girl who enjoyed scrawling dreadful melodramatic fantasy stories in spiral-bound notebooks – just how badly I wanted to be one of those other people. I honestly never imagined I’d actually get to do it. “Where You’re Planted” is a story for that teenage girl: the kind of story she loved reading, and the kind of story she’d have wanted to write. It’s a story about finding your gifts, finding home, and finding your family, not necessarily in that order. And as I’ve recently been wallowing happily in the very early Darkover novels, it’s also a traditional sort of “A Terran walks into the Darkover spaceport…” story. DJR: Was writing this story different from a typical writing project? How did you balance writing in someone else’s world and being true to your own creative imagination? DJR: Is there another Darkover story you would particularly like to write? RF: Several! I’d love to tell the story of Cat’s parents, Jameson MacRorie and Miralys Ridenow (with a likely title of “The Short Inglorious War”), and I would also love to write about some of the Terranan scientists who came to Darkover, and what they found when they got there. DJR: What have you written recently? RF: Nothing much anyone reading this interview would be interested in – for my “day job,” I’m an associate professor of biology at a private college. In addition to teaching, I do field research in ecophysiology and bird behavior, and at the moment I’m up to my eyeballs in jargon-filled scientific manuscripts I need to finish and submit to various professional journals. DJR: What lies ahead for you? RF: I have a couple of short stories in the works for other anthologies that should be out within the year. I’m also busy with the manuscript for a fantasy novel that can probably best be described as early John Le Carre meets Grimm’s fairy tales, and which was tangentially inspired by (of all things) the incredibly bizarre music video for the Ylvis song “What Does the Fox Say?”. DJR: Anything else you’d like our readers to know about you, Darkover, or life in general? RF: I’m really terrible at talking about me, me, and also me, so I think I’ll stop here before I hurt myself.